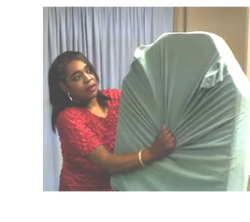 Traditionally, hospitals have used flat or fitted twin bed sheets on big wheel stretchers. Industry is trending towards more frequent use of stretchers (specialized departments, out-patient surgery, etc.) that use hexagonal shaped stretcher mattresses. Due to high turns, stretchers generate comparable linen service load to hospital beds. Poor sheet fit and position retention mean uncomfortable patients and higher costs. fitted bottom sheet 22 oz. fitted stretcher sheet 15 oz.